John Flowerdew is Emeritus Professor at City University of Hong Kong and a visiting professor at Lancaster University. He has authored and co-authored several books including: Advances in Discourse Studies (with V. K. Bhatia and R. Jones, 2008), Critical Discourse Analysis in Historiography (2012), Discourse in English Language Education (2013), and Discourse in Context (2014). He serves on the editorial boards of a range of international journals, including Critical Discourse Studies, Journal of Pragmatics, Journal of Language and Politics, and Journal of English for Specific Purposes. 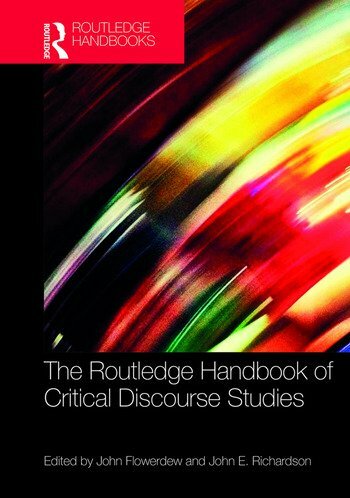 John E Richardson is a Reader in Critical Discourse Studies at Loughborough University. He is Editor of the international journal Critical Discourse Studies and has authored or edited several books including: Analysing Media Discourses (2011), Analysing Fascist Discourse (2013), Advances in Critical Discourse Studies (with M. Krzyzanowksi, D. Machin, and R. Wodak, 2014), and British Fascism: A Discourse-Historic Analysis (forthcoming).